It has been requested that this article be rewritten and expanded to include a Gameplay section with subsections for each mode and feature (Mellow Mode, Scrapbook etc.) Conjectural names should also be updated to official ones found in the Scrapbook. 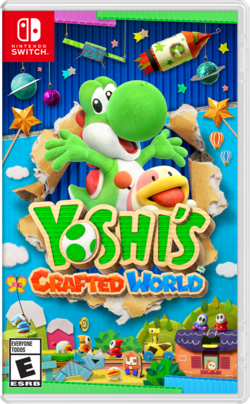 Yoshi's Crafted World is a title in the Yoshi franchise, the sixth main platform game starring Yoshi, and the follow-up to the Wii U title Yoshi's Woolly World, released for the Nintendo Switch on March 29, 2019. It was developed by Good-Feel, the developer behind Yoshi's Woolly World and its Nintendo 3DS port Poochy & Yoshi's Woolly World. As such, the game features similar elements from that game, having a hand-crafted look and Yoshi as a playable character. However, Yoshi is not made of yarn as he was in the last title, instead appearing to be made of a plush fabric-like material. The new gameplay feature is the ability to flip between the front and back of stages and to throw Yoshi Eggs on a three-dimensional plane, and the path Yoshi is able to follow is indicated by a yellow pathway. Players can also flip the perspective of levels in two-player mode if both Yoshis Ground Pound. A demo of the game was released on the Nintendo eShop on February 13, 2019, which covers the first level of the game. In the demo, players have the option to play in either Classic or Mellow mode like in Yoshi's Woolly World. The demo also showed a souvenir hunt for five cardboard cows. Yoshi gains cardboard costumes to wear that have varying designs, replacing the patterns from the previous games. There are ones based on Bullet Bills and the Nintendo Labo. The Yoshis are seen resting on their island, gathered around the Sundream Stone, an artifact said to possess the power to make dreams come true. Suddenly, Kamek and Baby Bowser, who have heard the legend of the Sundream Stone, arrive at the island to take it for themselves. The Yoshis attempt to save the artifact from being stolen, which leads to its gems becoming detached. These gems are flung across multiple worlds, as are the Yoshis, Kamek, and Baby Bowser. After the Yoshis collect all the gems, Kamek steals them and grants Baby Bowser’s wish, creating a robot and then transforms Baby Bowser into a giant. After he is defeated, the Yoshis restore the Sundream Stone and wish to go home. Egg-Plants Plants that emit Yoshi Eggs. Poochy A canine ally who can be ridden and driven into obstacles and enemies to destroy them. He follows Yoshi. Poochy Pups Three miniature Poochies, each displaying a distinct coloration. They form an objective when levels are played from the backside; they must be spotted in the background of each stage and hit with a Yoshi Egg to reveal them. After coming out of their spots, they follow Yoshi until the end of the level. Sundream Stone A sentient stone tablet that has five gems which are detached by Kamek and Baby Bowser. Blockafellers Robots constructed of blocks that resemble Wigglers who sit outside several worlds and send the player on side-quests. Each Blockafeller has a different appearance. Shy Guys Enemies that come in various colors. They are commonly found on Yoshi's track where they walk from side to side. Running into a Shy Guy can harm Yoshi. However, these enemies can be defeated by any attack method. Sometimes, Shy Guys hide in the background and can be defeated by throwing an egg at them, making them drop any collectible they carry. Bazooka Guys Enemies that carry bazooka-like weapons. They are completely stationary and shoot projectiles in the direction they face. The projectiles move on a straight line and can hurt Yoshi, but will self-destruct after some time. These enemies can be defeated in any way. Fat Guys Voluminous Shy Guys that pace back and forth. They start to run when jumped on and can hurt Yoshi if they touch him. They can be defeated with an egg throw or by eating them. When eaten and swallowed, Fat Guys fill up Yoshi's egg stash. Some Fat Guys stay behind large rectangular cutouts, which they push to fall on Yoshi's path and then rise back upright. Yoshi can use these cutouts as platforms. Fly Guys Enemies that have the capability to fly using the propellers on their heads. They fly back and forth on a straight line or swirl in formations around a platform at varying speeds, hurting Yoshi if they bump into him. They can be defeated in any manner. Sometimes, Fly Guys carry items which can be obtained by smacking them with an egg or by eating them. Glider Guys Enemies equipped with a glider, which allows them to float through the air. They make swoops above an area, turning around and descending a bit with each swoop. After they land, they act like normal Shy Guys. They can hurt Yoshi upon contact, but can be defeated with any attack. Knife Guys Enemies that rush in one direction while holding a knife forward. They can hurt Yoshi if they come into contact with him. However, any attack can be used to defeat them. Ninja Guys Enemies that stay in one place while hurling an indefinite amount of shurikens in the direction they face. They only throw shurikens as long as Yoshi is located in front of them. Ninja Guys can be defeated with any attack. Petal Guys Shy Guys that disguise themselves as piles of flowers. They then pop-up when Yoshi approaches. Pirate Guys Enemies that occupy ship cutouts which move in the background. They operate cannons that fire projectiles at Yoshi's own ship. A Pirate Guy can be defeated by wrecking its ship with a cannonball. Shy Stacks Tall stacks of Shy Guys. When Yoshi defeats one of the Shy Guys, the others fall until no more remain. Spear Guys Tribal Shy Guys that hold spears and shields. They are immune to being hit from the front. Vampire Guys Shy Guys dressed with a black suit and a red cape which allows them to glide through the air. Once they reach the ground, they act like normal Shy Guys. Although dangerous to bump into, they can be defeated using any attack method. Woozy Guys Shy Guys that move by doing continuous frontflips. Zombie Guys Undead relatives of Shy Guys that shuffle slowly on the ground. While usually found in the open, they can also come out of burrows on the ground. They are harmful if touched, but Yoshi can defeat them with any attack. Zombig Guys Undead relatives of Big Guys that are mostly stationary, although some are encountered walking back and forth in a staggering manner. They can be defeated by throwing an egg or eating them. Like their living counterparts, they can fill up the player's egg stash upon ingestion. N/A Shy Guys that run around in small dinosaur skulls, trying to ram into Yoshi. They turn around when they bump into something. Bullet Bills Black bullets that are shot out of Bill Blasters. Bungee Piranhas Purple Piranha Plants that stretch down from the ceiling. Cheep Cheeps Small red fish that jump out of the water in an attempt to hit Yoshi. Chompagobblers Blue enemies that patrol certain areas of the level Haunted Maker Mansion. When they see Yoshi, they chase after him at an extremely fast speed until he goes away. Clawdaddies Orange crab enemies, Yoshi must first lick the wool off of them and then throw an egg or Ground Pound to defeat them. Cybos Normally helpful allies, Cybos become hostile when an asteroid hits the space station in the level Space Hub Hubbub. Fangs Small bats that flap in wavy patterns. Fooly Flowers Enemies that mimic the appearance of a Smiley Flower, although they have a different facial expression. In some levels, Fooly Flowers rotate around a specific area during bonus challenges, hiding a Smiley Flower among them. Flutters Flying enemies that get enraged and go after a Yoshi briefly if hit with any attack method. They cannot be defeated. Gargantua Blarggs Huge, invincible, red monsters that live in the lava. They can be sent back into the lava with three egg hits, but only temporarily. Goonies Flying bird enemies that travel in flocks. They flap their wings to rise, then glide to descend a bit. Yoshi can step on Goonies and use them as platforms, although this causes them to go downward under his weight. Gusties Enemies that fly from the right. Koopa Troopas Enemies that walk back and forth. Yoshi can grab them in his mouth. Killer Clowns Doll-like clowns that try to attack Yoshi with an axe. Li'l Marchers Enemies that chase after Yoshi when he activates an alarm. They are defeated by throwing an egg at them. Little Mousers Small purple mice-like creatures wearing bandanas. Lunge Fish Gigantic green fish that jump out of the water in an attempt to eat Yoshi. Mels Caramel enemies that move around in tower formations. They can hurt Yoshi if they bump into him; however, they can be defeated one by one by eating and turning them into eggs or by throwing an egg at them. Monty Moles Mole enemies that pop out of manholes in the background. They can be hit with eggs. Nep-Enuts The aquatic variation of Gargantua Blarggs. Piranha Plants Stationary carnivorous plants that chomp at the air aggressively, waiting to bite and injure Yoshi. They can be defeated by hitting them with an egg. Ravens Black bird enemies that circle around small moon-like platforms. Skelesaurus A massive, living fossilized dinosaur that chases Yoshi, destroying everything in its path. Tap-Taps Silver, spiky enemies that walk around. They are immune to most attacks. Ukikis Brown monkeys that jump around. Some throw things, like missiles and eggs. N/A Pink round creatures with curled, squirrel-like tails. N/A Brown, rolling prickly creatures with an angry look. N/A Mels covered in tinfoil. They also walk from side to side in tower formations, but cannot be eaten or defeated with an egg throw. Instead, the player can use Poochy to knock them out. Yarrctopus* A pirate octopus. The player needs to knock the ship's panels on him to cause damage. Tin-Can Condor A giant bird made from crafting equipment. The player needs to use a magnet to pull it to the floor, then Ground Pound his head when his crown falls off. Burt the Ball A big rubber Burt. The player has to spit Bumptys back at him to knock him into the water and Ground Pound his weak point. Spike the Piranha A giant Piranha Plant boss, similar to Naval Piranha and Big Bungee Piranha from other Yoshi games. The player needs to hit him on the head with a spiky ball to do damage. The Shogun* A samurai made from a can. Although defenseless, Yoshi must solve his puzzles and then Ground Pound his head. Gator Train A giant train shaped like an alligator, originally shown in the earlier trailers for the game. It is defeated by hitting the inside of its mouth with an egg when it charges the player's own train. Mr. Geary* A gear, which the player must defeat by knocking the paper off of it with eggs. Baby Bowser The main antagonist of the game. Phase 1 has the player throw eggs at his new robot's hands to fling into the foreground for a Ground Pound, whereas phase 2 has them use giant hammers to damage his giant form in the background. Kamek Baby Bowser's assistant himself, who acts as a secret boss in this game. Yoshi must first fight him in a giant robot, then use his tank form to fight him while giant. *This boss is a mini-boss and therefore does not have a Dream Gem. N/A A blue alien Blooper-like entity. Coins The most common items in the game. They can be collected normally when found floating in the air. However, there are other means of obtaining coins, such as hitting certain Winged Clouds or stealing them from Shy Guys and Fly Guys. Yoshi Eggs will also drop coins when they hit an enemy after rebounding off a wall or a platform. Large coins worth ten regular coins, although rarer, are also common. Blue Coins Collectibles that are carried by Shy Guys. Red Coins Collectibles that are commonly found among regular gold coins. There are twenty scattered throughout each stage, sometimes carried by enemies. Checkpoint Bell The checkpoint mark of a level. It resembles an upright plant with an upside-down bell with eyes for a flower. Upon passing a Checkpoint Bell, part of Yoshi's lost energy is restored and any enemies present around the area turn into Hearts. Egg Blocks Blocks that produce Yoshi Eggs when hit from the bottom. They stop giving out any more when there are six present on-screen. Hearts Small items with eyes and feet that hop around slowly. They can be collected to regain energy. They are produced by Winged Clouds, but also appear from enemies who are caught on-screen when Yoshi passes a checkpoint. Shortly after spawning, hearts start to flicker and eventually disappear, making them temporary. Key Items that can open locked doors. Message Blocks Smiling blocks which provide tips and hints. Smiley Flower Smiling flowers that are often hidden in levels, with the amount varying per level. They can be collected by simply touching them, but Yoshi can also toss an egg at them. They can also be obtained by completing objectives such as searching for souvenirs and Poochy Pups. Spring balls Round objects with an upward arrow imprinted on them. Winged Cloud Stationary objects that hover above the ground. They turn into an item or a formation of coins when hit with a Yoshi Egg. Yoshi Eggs Objects that Yoshi can throw at various elements in his close environment. Yoshi Eggs can be aimed with a moving cursor and thrown on both Yoshi's plane and the surrounding planes. They are able to defeat enemies, topple backdrop objects, or trigger switches and other mechanisms to change the environment. If they rebound off a surface and hit an enemy afterwards, they produce three coins. In addition, they can be thrown at coins and Smiley Flowers to collect them. Red Eggs give three Hearts to Yoshi when used to defeat an enemy, Blue Eggs give three Yoshi Eggs, and Orange Eggs give three Coins. The items released from the Yoshi Eggs are automatically collected upon spawning. Winged Timer Cloud Winged Clouds that display clocks on them. When hit, the perspective is flipped 180 degrees, allowing Yoshi to see elements previously located behind the camera. However, this happens for a limited time, during which Yoshi can play a minigame of aiming and throwing eggs at enemies to receive a prize. A blue variant exists as well, tasking Yoshi with either collecting some blue coins, popping balloons with eggs, or eat all on-screen apples within the time limit. Yoshi's Crafted World has received generally positive reviews. Critics have praised the game's aesthetic and number of collectibles, but the difficulty and music have been criticized. IGN 7.8/10 "Yoshi’s Crafted World is an engaging and charming platformer that is absolutely worth playing, but it misses a clear opportunity to be more than that by not taking full advantage of its most clever ideas. It has enough creative collectibles to make completionists want to hunt down every last one, but I’m disappointed Crafted World didn’t challenge me more in the way its last few levels proved it could have. Of course, I still thoroughly enjoyed every adorable hour I spent with it." Destructoid 7.5/10 "Most of my journey through the wonderful cardboard universe of Yoshi's Crafted World, littered with myriad ridiculous noises from Yoshi, was spent with a smile on my face. It's not the type of project that's going to set the world on fire like Tropical Freeze, but it still has more heart than most studios could ever hope to give in their lifetime." GameSpot 8/10 "Yoshi's Crafted World is at its best when it's relaxing and pleasant. The 2D-to-3D level design keeps you curious while the go-at-your-own-pace approach keeps the pressure off and leaves you to appreciate the small, imaginative details. Its most interesting ideas never evolve past their first introductions and are frequently confined to one or two levels, but individually, those levels both reward your curiosity and your willingness to slow down and look at what's around you--and it's those simple pleasures that provide the most joy." For this subject's image gallery, see Gallery:Yoshi's Crafted World. 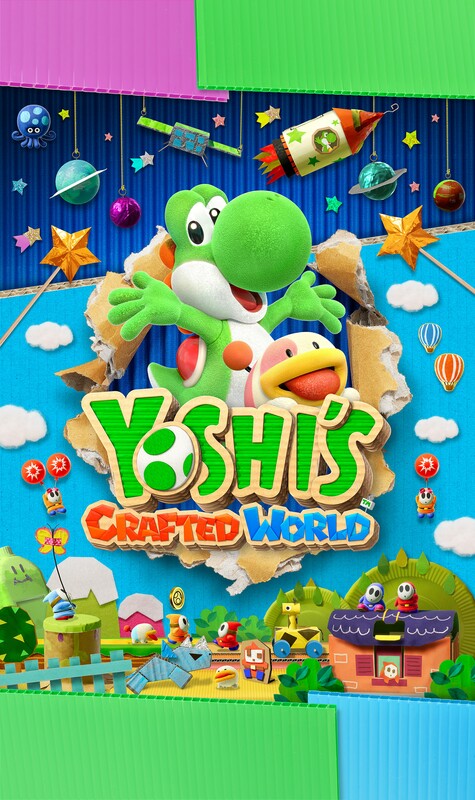 Yoshi's Crafted World was developed by Good-Feel in collaboration with some staff for Nintendo, most of them are a follow-up from Yoshi's Woolly World. The game was directed by Masahiro Yamamoto, game design was led by Yosuke Suda, programming by Yasuhiro Masuoka, art by Ayano Otsuka, the whole game soundtrack was composed by Kazufumi Umeda, and was produced by Etsunobu Ebisu and Takashi Tezuka. Mario & Luigi: Superstar Saga: Certain level elements are made from Starbeans Iced Coffee boxes, referencing the Starbeans Cafe from this game. Mario Kart 8 / Mario Kart 8 Deluxe: Many of the craft materials are packaging from products, including the sponsors Fuzzy Battery, Moo Moo Meadows Milk and Princess Orange from these games. Additionally, "Handle with care" stickers featuring ? Blocks from Sunshine Airport appear on various objects in the scenery. Yoshi's Woolly World: Green Yarn Yoshi, Light-Blue Yarn Yoshi, and Pink Yarn Yoshi all appear as collectible amiibo costumes by scanning their respective amiibo. Poochy & Yoshi's Woolly World: Poochy Pups return from this game. Super Smash Bros. Ultimate: Yoshi's in-game design is featured as one of his alternate costumes in this game, and also appears as a Fighter Spirit. This is the first Yoshi game with Burts to not feature them as a boss of World 1. This is the first Yoshi game without the game files option at the start. ↑ GameXplain. (March 27, 2019). Yoshi's Crafted World - REVIEW (Nintendo Switch) YouTube. Retrieved March 27, 2019 (PST). This page was last edited on April 20, 2019, at 12:46.